This drawing game invites players to make temporary "tattoos" on fellow players. Draw a lobster on your sister's shin or a Viking on your best friend's elbow with this drawing game where players' skin is the canvas. Players choose a Doodle card, a Body card and the player they want to "ink," then the others race to guess what the "tattoo" is and earn points for guessing and drawing. 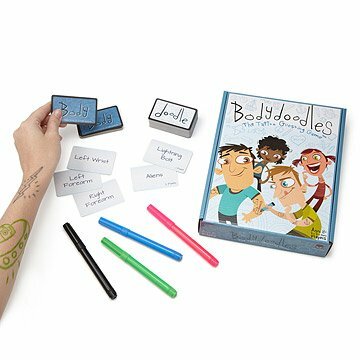 Awarded Game of the Year (2014) by Creative Child Magazine, Body Doodles is perfect for play dates, babysitters, birthday parties, sleepovers or any time a group wants to be creative (temporary) tattoo artists. The markers are skin safe and safety tested to both cosmetic industry and toy and game industry standards, so there are no worries about that temporary tattoo becoming permanent. Components made in China and New York. Markers are skin safe and wash off easily from most skin types. For best results, use a washcloth with soap and warm water. Markers may leave a bit of residue on some skin types, this is harmless and will fade and disappear usually after bathing. If this is a concern, test a small area prior to use. Not recommended for use around eyes. Markers wash out of most clothing using standard laundering procedures. My daughter loved playing this game with her friends! Kids enjoyed hours of fun playing this game on New years eve. Great game for kids. The markers washed right off after use. This game was a lot of fun on Christmas Eve when we played it with all ages! My niece's family is having a fun time playing this. This was the first game that was played with once gifts were open. Both kids and adults played and had fun with it. The ink is also easy to remove with no lingering residue (that was a concern). Even the teens enjoyed it the next day. This was given at a teen's birthday party and played at the party. Great party game for teens. The concept is like Pictionary on your body. But the silliness and contact nature of the game reminds me of Twister. "Best gift EVER!" as stated by my niece. I bought this gift for my own daughter, my niece and my neighbor girls. They all loved it! They each had so much fun drawing on each other, flipping through the cards. It was non-stop laughter! The markers washed off easily too! Great game! I will give this for every future birthday party my daughter gets invited too. Such a hit! Unusual but so much fun! Kids and grandkids were thrilled with this game. They had a great time playing it and shared lots of laughs together! I purchased Body Doodles because I thought it was unique. We played it with a group and it was fun but difficult to draw on body parts covered by tights or boots. Recommend for beach or summer!